Preheat the oven to 180. Grease two 8” round cake tin with butter and line with parchment and keep it ready. In a deep bowl, sift together all purpose flour, cocoa powder, baking soda and salt. In another bowl, combine together buttermilk and vinegar and keep it ready. In another bowl, cream together butter and sugar till creamy. To this add vanilla essence and eggs (one at a time) and beat till combined, scraping the sides of the bowl occasionally. Add the cream to this mixture and combine well. Add the flour mixture and buttermilk to this mixture little by little and stir till combined. Now add the red food colour and combine evenly. Pour this batter in the prepared cake tin and bake for about 35 – 40 minutes or till done (check by inserting a tooth pick at the center of the cake, if it comes out clean, the cake is done. Remove it from the oven and cool it at room temperature for about 20 minutes. Remove the cakes from the cake tin carefully and cool it over a wire rack. Cut the cakes on top to get neat layers (reserve it to garnish the cake). In a deep bowl, beat together all the above ingredients till soft and creamy, for about 5 – 6 minutes. 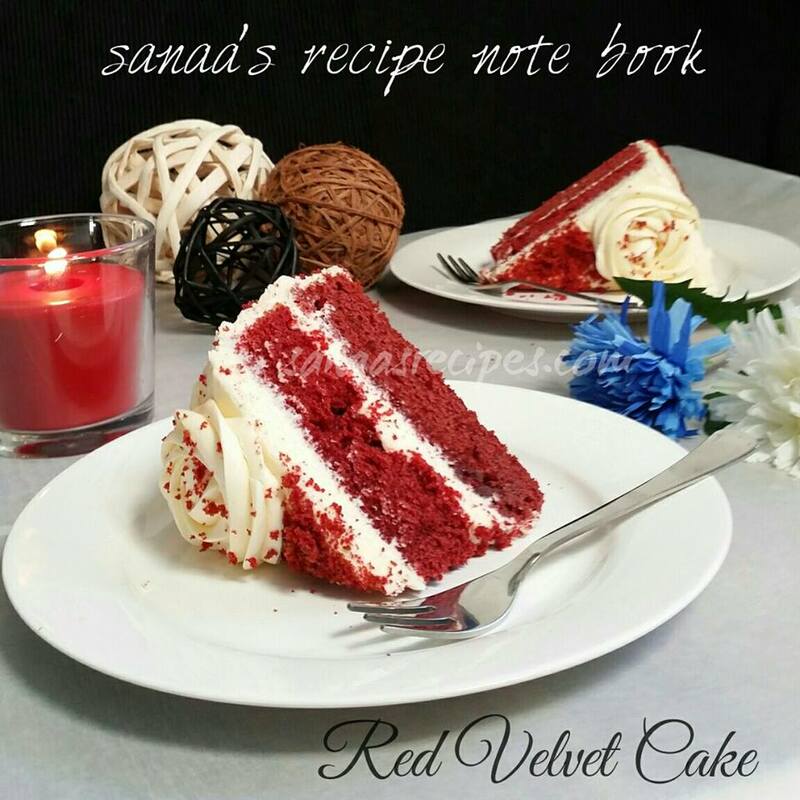 Place a layer of red velvet cake and spread ¼th of the prepared cream cheese frosting. Place the other red velvet cake on top and cover the top and sides with the remaining cream cheese frosting and do the decoration with the help of icing bag. Garnish with the cake crumbs. Serve cooled. Note : Prepare buttermilk at home if readymade one not available. For 1 cup of milk, add 1 tsp vinegar, combine and leave it for about 10 minutes and use in the recipe.